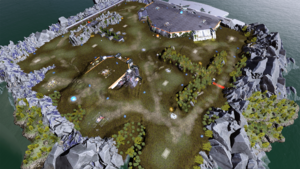 Fort Jordan is a multiplayer map available in Halo Wars 2, and a remake of the map Fort Deen from Halo Wars. Fort Jordan features of up to 3v3 battle with total of 14 base slot avaiable (6 main base, 8 outside main base). Player will be contesting against each other to dominate the map, lay siege, and destroy their base respectively. There are total of 3 power node that can be contested to gain more resources, the middle of the map provides a chokepoint that can be utilized as a killzone. The side of the map was closed by an impassable barrier as all players must pass through center of the map to reach other bases respectively. The game is only avaiable at custom games as there are more updates to come. On an isolated battlefield in an isolated war, old strategies return to relevance. "Poor kid never saw it coming." Corporal Kyla Emmett pulled the edges of a tattered UNSC banner over the lifeless body of a young Marine they'd all just called "Matthews." Kyla had seen plenty of action as a member of Boomerang Company - even well before this latest excursion to yet another otherwordly alien installation. The seasoned ODST had expertly dispatched the enemy scout responsible for their party's latest casualty, but it wouldn't make a difference in the long run if things didn't change quick. She was part of a dwindling resistance force stationed at Fort Jordan - a scrappy outpost set up on a strategically-located island on the Ark's surface. "Why are they even here?" Kyla's thoughts were interrupted by Jacob Arden, a Hellbringer with zero patience and even less of a filter. "Probably because we're still here." Even behind that gold-mirrored faceplate Kyla knew the facetious face he was making. She ignored him and gave a final once-over at their lifeline - a lone remaining Mastodon APC that allowed them to traverse the artificial island scavenging for supplies. Not to mention, it offered at least some sort of protection from the remaining Banished forces that lingered on with seemingly no other priority than to make their lives miserable. Jacob knew good and damn well why BOTH sides were still there. The UNSC had come here looking to set up camp near a downed Covenant craft in the hopes of salvaging anything the technicians on the Spirit of Fire might find useful. Not long after, the Banished came looking for it as well, led by a Jiralhanae warlord who had too much pride to call for backup. Immediately the Banished took down their long-range comms, and a battle of attrition began. For weeks numbers on both sides had been dwindling, and it seemed a final clash was not only inevitable, but soon at hand. Kyla was joined by two remaining members of her ODST contingent within Lotus Squad, as well as a specialist sniper, the sardonic Hellbringer, and three - well, make that two now - frontline infantry. A number that made it easy to fit in an M650 but difficult to win any wars. "We're out of time, Corporal." The transmission came crackling through her headset, carrying the voice of their sniper who had set up shop at the edge of their local comm range in the hopes of giving whatever early warning they could. Ristyx was on his way, and most Banished warlords weren't known for their diplomacy. The corporal slapped the side of the Mastodon and gave a signal to the others. "We're making another run for it?" "No Jacob," Kyla said calmly as her helmet fully polarized. "no more running." Fort Jordan was created by 343 Industries employee Matt Jordan as a personal project, in-between working on updates for Halo: The Master Chief Collection. Jordan originally tried out prototyping and bringing Blood Gulch into the game in January of 2018, but the map had problems and was scrapped. Fort Jordan was then built using Fort Deen's original map geometry, but scaled up to allow players more room to move their armies. The map was released on February 26, 2019, though limited to custom games-only while the map undergoes additional tweaking.